You won’t want to miss the fun at Family Day at the Lake Forest Park Farmers Market this Sunday, 10am to 3pm! Family activities will be the order of the day, starting with chalk artist Justin the Circler, who will be on-hand to share his creations and lead families in making their own chalk creations. The market will also welcome back the popular Bubble Zone where youngsters can experiment with an assortment of bubble wands in different shapes and sizes. Kiddos can also take away free mini-bubble bottles of their own while supplies last. Kids will love bopping around to the music of local favorites the Milner Family Fiddles at 11am, followed by a melodic tour of the Italian countryside with the music of the Tarantellas at 1pm. 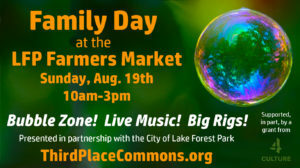 Family Day is co-presented by the City of Lake Forest Park and LFP Mayor Jeff Johnson will be there along with other city officials handing out goodies and sharing community information. The city will also bring in a couple of kid-friendly, “big rig” city vehicles for the little ones to explore. Third Place Commons also gratefully acknowledges the support of 4Culture for helping to make the day’s festivities possible. Of course, the market will also feature all your regular favorites like beautiful flowers, fresh produce, meat, fish, unique local and handmade products, and yummy treats. And as always, Market Bucks, SNAP, and WIC and Senior Vouchers are always welcome at the market, where we proudly participate in the Fresh Bucks matching program. The LFP Farmers Market is always a great place to spend your Sunday and this week it will be better than ever. So mark your calendars and don’t miss the fun! 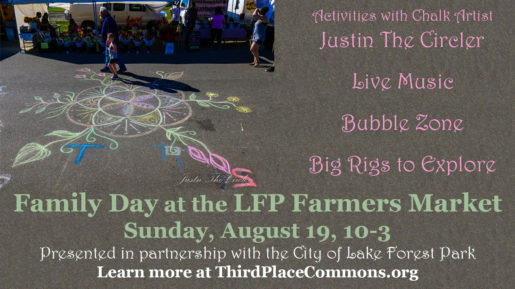 The LFP Farmers Market is presented by Third Place Commons and runs every Sunday from 10am to 3pm at Lake Forest Park Town Center at the intersection of Bothell Way and Ballinger Way. Previous Post: Crafts Day at the Market & More This Weekend!